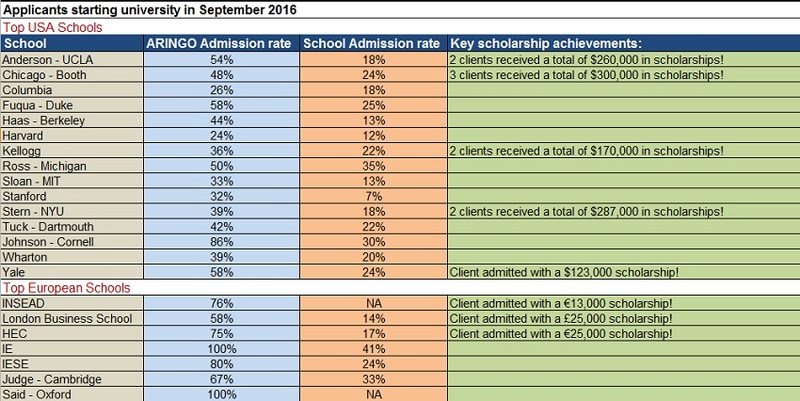 ARINGO Admissions Statistics | ARINGO consultants are the top in the world! All statistics include 100% of our clients who worked with ARINGO for 7 hours or more. 79% of all ARINGO MBA applicants who applied to INSEAD were admitted. 40% of all ARINGO MBA applicants who applied to Ross were admitted. 70% of all ARINGO MBA applicants who applied to UCLA were admitted. 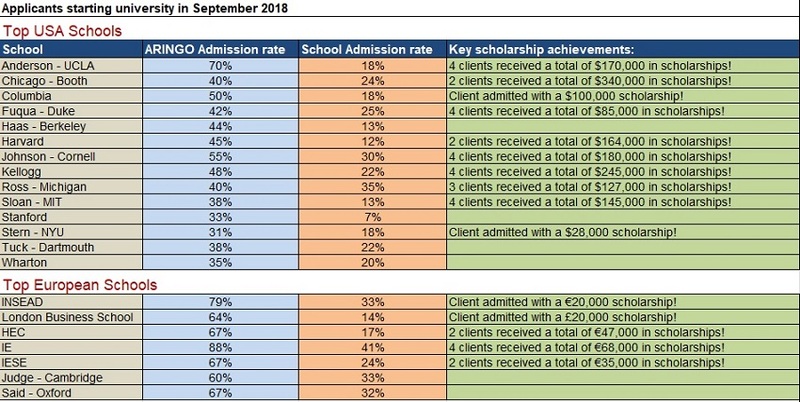 64% of all ARINGO MBA applicants who applied to LBS were admitted. 40% of all ARINGO MBA applicants who applied to Booth were admitted. 35% of all ARINGO MBA applicants who applied to Wharton were admitted. 48% of all ARINGO MBA applicants who applied to Kellogg were admitted. 33% of all ARINGO MBA applicants who applied to Stanford were admitted. 38% of all ARINGO MBA applicants who applied to MIT were admitted. 44% of all ARINGO MBA applicants who applied to Berkeley were admitted. ARINGO’s full statistics are validated by Ernst & Young.